At its December meeting the Federal Reserve has decided to reduce its asset purchases. It used to be USD 85bn since September 2012; it will be USD 75bn from next January. MBS and TBonds purchases will be reduced both by USD 5bn. During his speech at the Conference on IMF at the beginning of November, Larry Summers has a doubt on the ability of Western economies to return on the path of a strong and sustainable growth. How to clearly perceive the global outlook improvement ? 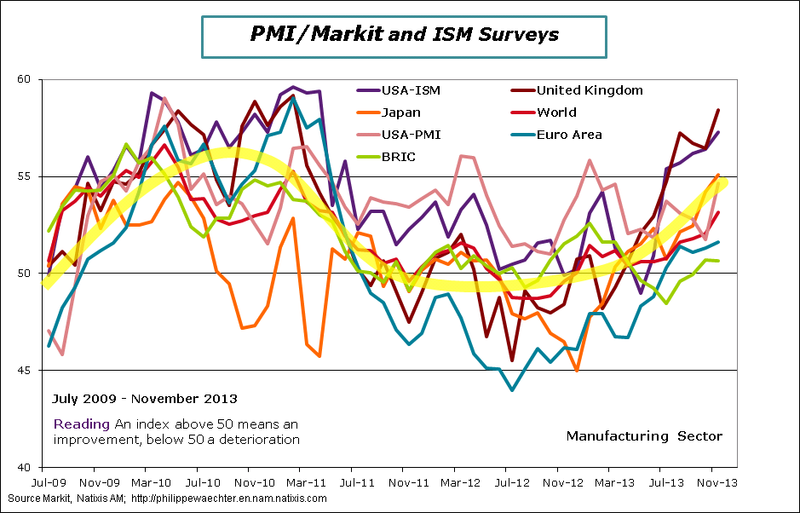 The graph below summarizes the perception that one can have of the manufacturing sector after the publication of surveys from Markit and ISM for the month of November. Numbers are better oriented, tending to move permanently above the 50 threshold separating improvement and deterioration of the outlook in the manufacturing sector. However, the multiplicity of indices do not allow an easy reading. I took the main indices and observed that they were all trending upward even if the pace is not the same everywhere. To visualize this shift I drew heuristically a yellow band that reflects this new dynamic. It has no scientific virtue but helps guide your eye on the change that is taking place. The activity was higher in 2009/2010, slowed in 2011 until the spring of 2013 with this yellow band close to the threshold of 50. Subsequently economic activity has improved, driven by the United Kingdom, the United States and even Japan. The Euro Area and BRIC are a little late. The yellow band is now following an upward trend. The whole reflects a more robust common momentum where risks of rupture are reduced. At this stage it is important to note that global dynamics may become stronger rapidly. Everyone must then contribute to it to its improvement .